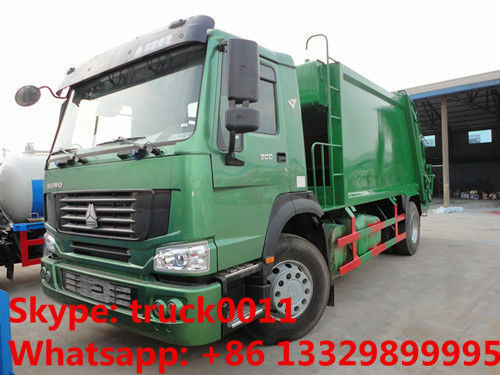 Chengli Special Automobile Co., ltd is as the leading manufacturer of municipal sanitation truck in China since 2004, is with the main garbage trucks series, such as compression garbage truck, swing arm garbage truck, hook lift garbage truck, derrick garbage truck, dump garbage truck, sealed garbage truck, self-loading garbage truck, etc. And the best selling garbage truck is just the garbage compactor trucks. Garbage basket:it is adopting the frame structure of welding the strengthen beam and steel, beatiful outlook, light weight, good load-carrying capability, non deformablity. The push shovel manufactured by steel skeleton and folded panel, not only delicate structure, but also making the garbage evenly, discharging clean thoroughly. The precompresser is made up of precompresser shell, operating slide, skimmer blade, etc. every compartment adopting good load carrying bean sheet or van structure, firm structure, ligh weight. The basket used phosphide anti-rust treatment, and coated with anti-rust painting. Hydraulic system: using the eletronic control and hydrualic control through controlled converting to make sure every activity accuratly and reliably. Adopting leading hydraulic lifting safety circuit,improving the using reliablity and efficiency. The principle is installing holding balancing valve in the hydraulic lifting cylinder. The valve stops the direct connecting between lifting cylinder and hydraulic hose, even the pipeline bursts, the precompresser cannot fall down suddenly as an accident, improving the safety. Charging and discharging way: flip bucket mechanism charging and discharging, non pollution to operation staff. 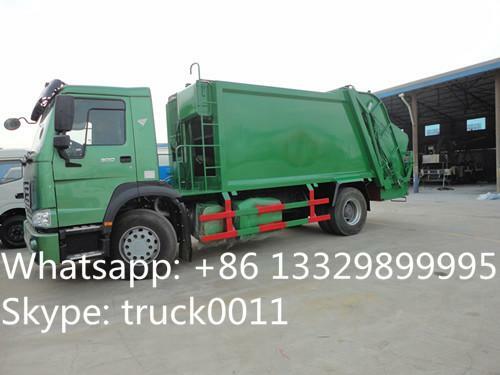 If you're interested in our sewage suction truck, please feel free to send email to truck0011@163.com or talk to Anita directly by Whatsapp/Wechat/Mob. : +86 13329899995. Hermetic dustbin, hydraulic system , electric control system, roll-over stand, push shovel, filler and slag trap. There is a special rubber strip sealing the garbage basket and precompresser, good sealing, without the second time pollution. 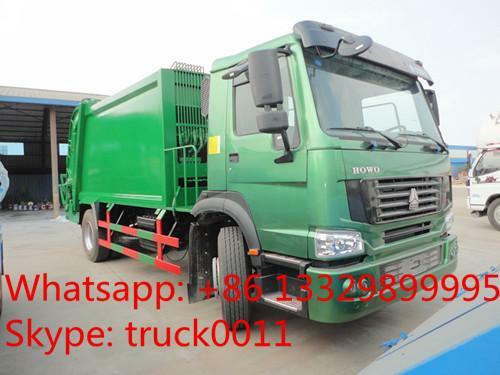 More pictures of HOWO garbage compactor truck as below. Garbage compactor truck equipped with waste water tank ,all waste water run into tank to avoid the second pollution during transport .